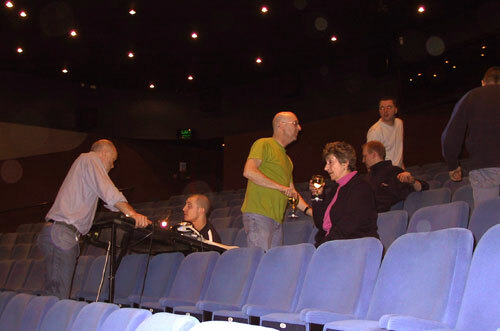 4th to 9th March 2002 at the Gordon Craig Theatre, Stevenage. Programme Cover: Click for a larger image. Photos of the show. Click for a larger image. The curtain rises on the main square of Seville where we find Officer Moralès and a group of soldiers passing the time of day watching the passers by. 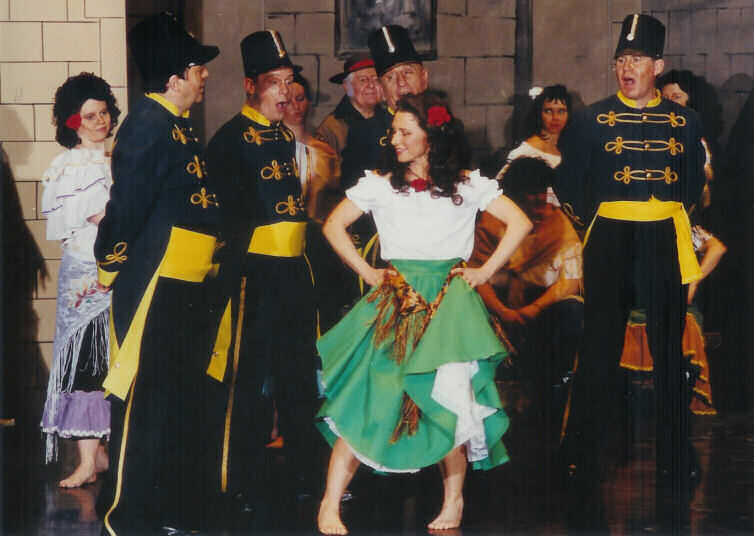 A peasant girl, Micaëla, enters the square looking for Corporal Don José but as he will not arrive until the changing of the guard Moralès and the soldiers invite her to wait with them. Frightened, she declines and makes her escape. Shortly afterwards the relieving guard arrives, mimicked by a group of street urchins, and Don José is told about Micaëla. The mid-day bell rings and the workers from the cigarette factory fill the square; flirting openly with any man present. However, the men are waiting for a glimpse of one girl in particular - Carmen. 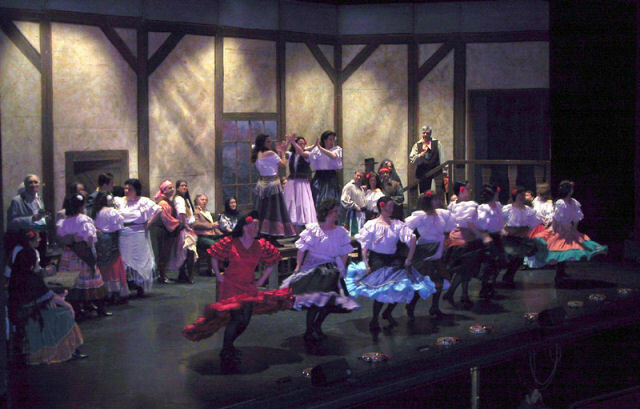 Carmen eventually arrives and makes false promises of love to the men. She sees Don José who appears uninterested in her so playfully turns her attentions solely to him and teases him. Shortly after the cigarette girls go back to work Micaëla returns and delivers to Don José a letter from his mother. Micaëla leaves him but his fond memories are soon interrupted by screams from the factory as the cigarette girls once again fill the square; this time arguing and fighting. 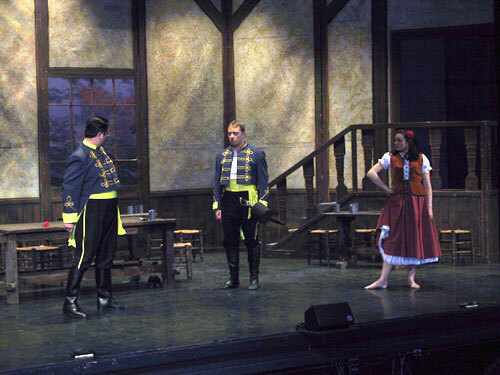 The soldiers are called upon to restore order and Lieutenant Zuniga is told how Carmen had started a fight. He sends for her to be brought to him. He questions her but she taunts him so Zuniga orders for her to be sent to jail. She is left in the custody of Don José who has fallen hopelessly under her spell and together they plan her escape. As agreed, she pushes Don José to the ground and escapes through the crowd. 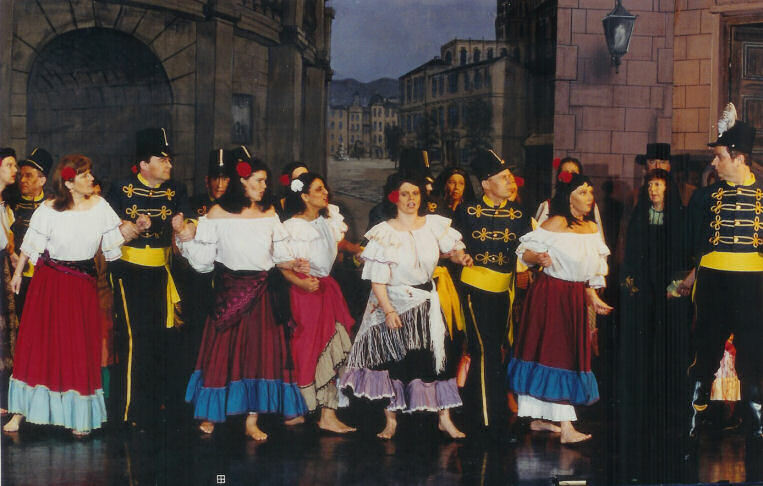 Act 2 opens on Pastia's tavern to reveal Carmen in the company of her friends Frasquita and Mercédès and also of Moralès and Zuniga. Frenzied dancing is shortly followed by the arrival of the famous bullfighter Escamillo whom everyone is pleased to see. 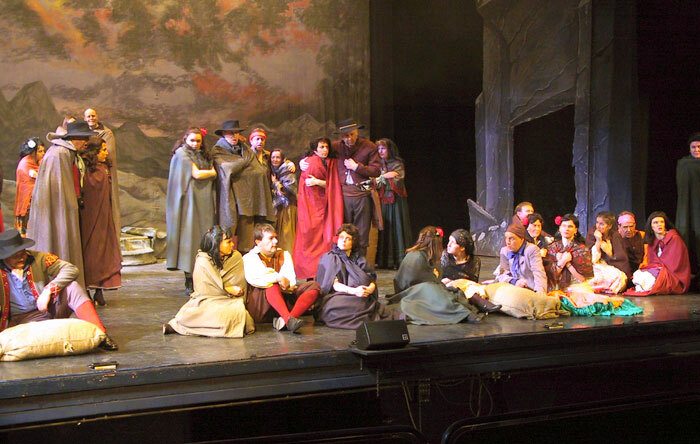 Escamillo is attracted to Carmen but is rejected by her and leaves followed by his entourage and Zuniga. The smugglers Dancairo and Remendado join Carmen, Frasquita and Mercédès to enlist their help in distracting the coastguard for their next crime. Carmen is reluctant and wants to wait for Don José. 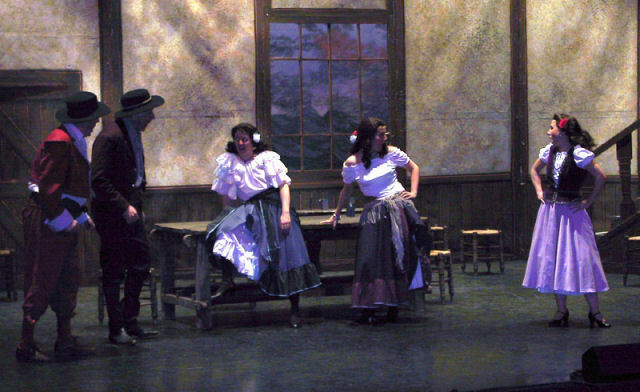 The smugglers suggest that she persuade Don José to join their band and they leave her alone to carry out the plan as they hear Don José approaching. 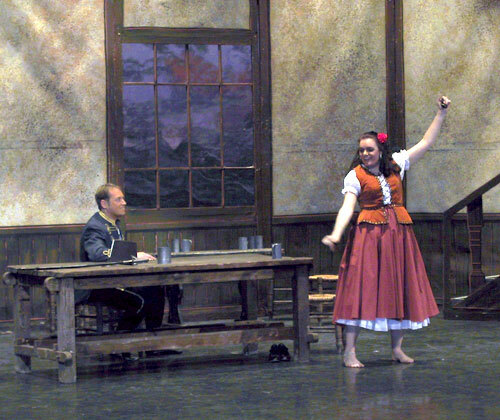 Briefly blissfully reunited Don José soon becomes jealous as Carmen tells of how she was made to dance for the soldiers but says she will now dance for him alone. The bugle dutifully summons Don José back to barracks but Carmen wants him to stay and join the smugglers and eventually taunts him when she thinks she is losing at which point he declares his love for her. 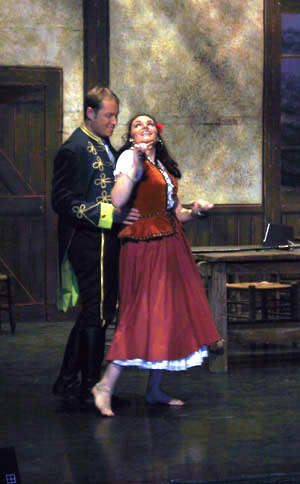 Zuniga returns in the hope of finding Carmen alone and mocks her for choosing a soldier when she could have an officer. In his anger, Don José draws his sword and challenges Zuniga. Carmen calls for the smugglers help who return to lead Zuniga off at pistol point. Don José now has no choice but to join the smugglers. 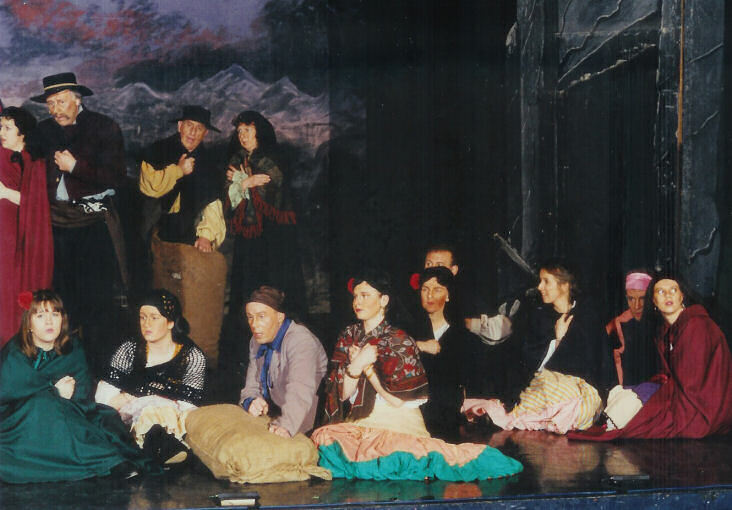 The smugglers' mountain camp opens Act 3 and in amongst the merriment we see a remorseful Don José. Carmen, tired of Don José's jealousy has an argument with him then joins her friends who are fortune telling with a pack of cards. They are happy as fate favours them. Carmen draws her owns cards. Spades - a grave! ... death! "First me, then him" she scorns - pointing at Don José. Dancairo and Remendado return to gather their band and depart leaving Don José behind to guard the camp. 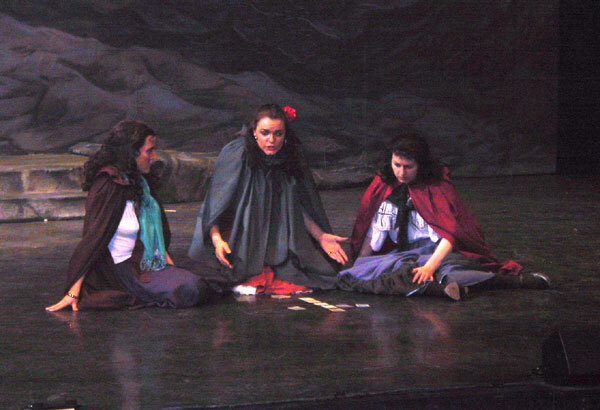 Micaëla is shown to the camp searching for Don José but does not see him and, frightened, leaves again. Meanwhile, Don José shoots at someone approaching the camp but Escamillo announces himself before he can fired upon again. 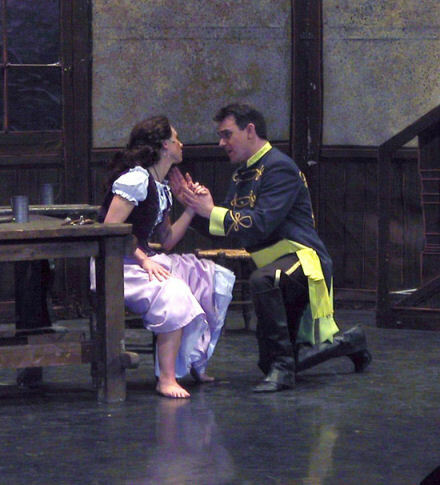 Escamillo says he is looking for Carmen because he has heard that her love for the deserter soldier has now faded. Infuriated, Don José draws his knife and a fight ensues which he is about to win when the smugglers return an intervene. In gratitude, Escamillo invites the smugglers to his next bull fight and leaves telling Don José that they would fight again one day. Micaëla is found wandering the mountains and brought to the camp where she implores Don José to return with her. 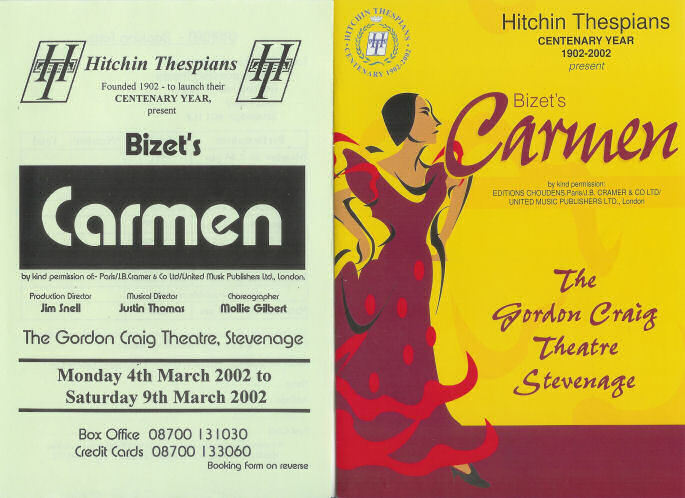 On hearing that his mother is dying he leaves reluctantly and tells Carmen that "we shall meet again". The outside of the bull ring is the setting for Act 4. It is the day of the bull fight and the square is filled with spectators and hawkers. The crowd becomes increasingly excited as the toreadors' procession approaches and a great shout goes up as Escamillo enters with Carmen by his side. 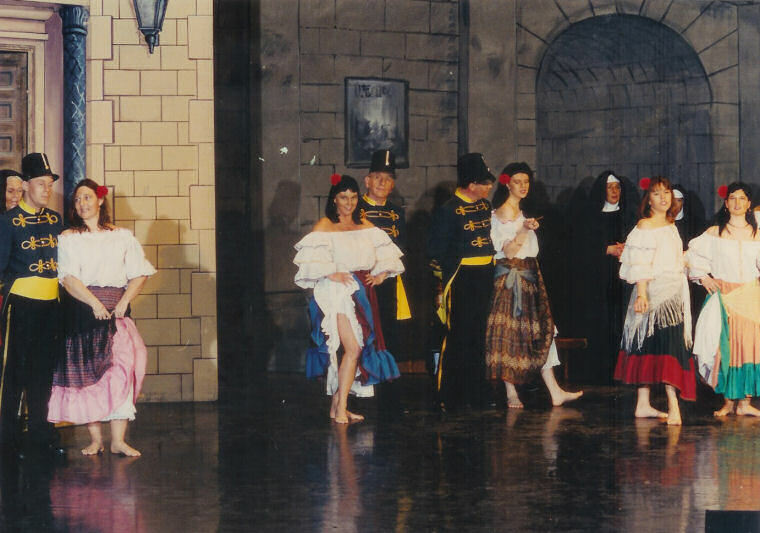 As Escamillo enters the building Carmen is warned by her friends that Don José is lurking in the crowd. Carmen refuses to be intimidated and tells them to leave her to face him alone. Shortly after they leave she is confronted by a desperate Don José who pleads with her to go with him and start a new life together. She refuses bluntly saying that she does not love him and that she never will adding "free I was born, free I shall die!" A fanfare sounds in the arena and a victory chant goes up for Escamillo. Unable to hide her delight, Carmen turns to go in to the arena but is blocked by Don José. He is full of jealousy and tormented by the pain of rejection. Ever defiant, Carmen tears his ring from her finger and throws it to the ground before rushing past him toward the entrance. Incensed beyond control Don José rushes after her and madly plunges his knife in to her back. With a blood-curdling shriek she falls to the ground dead. The crowd pours from the arena but is suddenly halted in horror at the sight of Carmen's lifeless body. "I am your prisoner" cries Don José to an officer before throwing himself over the body of his beloved Carmen.